No, not quite a zero because my plan B small appliance worked…but…oh anyway let me back up here a minute. What was going to be a relaxing afternoon of cooking to top off a wonderful 4-day weekend (wow, I love my job, but I really needed a little time off!) turned into a brow-furrowing series of setbacks and challenges. But sometimes that happens with cooking, right? And trying new recipes? Sometimes it doesn’t go so great. BUT the end result…an intriguing, delicious new big bowl of soup for a late lunch…and leftovers for later! 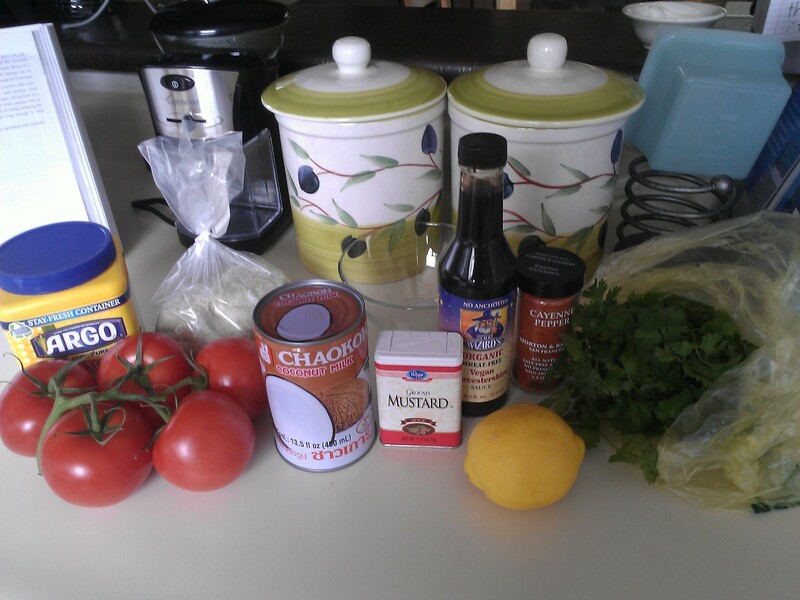 Here are a few ingredients for this latest soup creation in the picture. That’s a bunch of cilantro on the far right – yum! What was missing? My chicken broth (in the fridge), a 1/2 lb of shrimp (safely tucked in the fridge too)…and…an onion. Which was nowhere to be found. Ew…all I had was half of a leftover onion in a Tupperware in the back of the fridge, covered in mold. To the trash it goes! So I had to go back to a grocery store AGAIN for just onions. Earlier this morning I made a run to our local Metropolitan Market. How I ADORE this grocery store! Everything is absolutely exquisite all the time. The place pulses with happiness…and some of the friendliest workers I’ve ever encountered. So helpful! I picked up the fresh shrimp this morning, wrapped up and handed to me over the counter with a big smile from the seafood guy, and even found that darn ol’ Lapang Souchong tea I was grumbling about for the marinade for yesterday’s food experiment. Aha! And I swung by the cheese section and tried a sample of a mouth-watering English cheddar with mustard seeds. Amazing. But when I got home and realized I didn’t have any onions, I just made a quick hop to the Albertson’s down the street from me. They’re a foolproof store for cheap basics, not specialty items. I carefully read the recipe all the way through like the good budding amateur chef I strive to be. I knew the soup base would be an onion, garlic and tomato puree, and for that I’d need to go grab the big Cuisinart off the top shelf in my pantry. For some reason I decided to make sure it was working properly before I started putting chopped food in it. And I’m so glad I did. I could NOT get the upper lid and feed tube section to latch on properly to the main bowl. So obviously it wouldn’t run, for safety reasons. This was killing me! My beloved Cuisinart…I’ve had her probably 15 or more years. I don’t use it all the time, but when you need one, you need one. It looks like there is a tiny plastic piece that should engage with the bowl to lock it that is slightly bent or warped. It probably got bent or warped in the dishwasher (note to self…hand wash Cuisinart parts from now on). ARGH. I am hoping the nice people at Cuisinart will be able to provide some spare parts online; I would hate to have to drop major bucks on a new one for something as small as a tiny, bent plastic part! So I was relieved I’d discovered this problem before filling the bowl with the ingredients. On to Plan B…the (Cuisinart) stainless steel blender. Which leaks. I have no freaking idea why but this has been a constant problem too. Not a lot, but just enough to be annoying, no matter how tightly I screw on the blender to the base. I know to keep a spare towel nearby when I’m done blending. But, on the good side, the blender was working so I was able to make this soup and savor a bowl this afternoon. This is probably the most unusual combination of ingredients (coconut milk and Worcestershire sauce? Combined?) and preparation method, which made it so intriguing. Place the onion, garlic and tomato in a blender or food processor and process until smooth, adding a bit of the chicken broth. Add the rest of the chicken broth and process for a few seconds until the mixture is smooth. Pass the puree through a medium-mesh sieve. Put half of the shrimp in a blender or food processor and process until smooth, adding a bit of the chicken broth puree as necessary. In a 4-quart saucepan, combine the remaining chicken broth puree and the shrimp puree and mix well. Bring to a boil over medium heat, reduce heat to low and simmer for 5 minutes. Add the Worcestershire, dry mustard, cayenne and the coconut milk and bring back to a boil. Stir in the cornstarch mixture and simmer until thickened, stirring constantly. Add the rest of the shrimp and cook until the shrimp turn pink and begin to curl, about 1 minute. Add salt and black pepper to taste. Serve in soup bowls, garnished with a lemon slice and the mint and cilantro. Fivenineteen notes: Don’t freak out about the coconut milk if you’re not a coconut fan. This is not sweet like the shredded coconut you see on desserts. It’s a rich, savory and nutritious compliment to the shrimp – the flavors combined are incredible (and it won’t taste “coconut-y,” trust me). I would add more than a pinch of cayenne pepper – I prefer my soups a bit spicy. It also seemed a bit of a shame that so much of that chicken stock used in the pureeing process went down the drain after straining through the sieve. I’m not sure why so much was needed – perhaps to infuse the puree with chicken flavor? Next time I will use cheaper, canned stock rather than my pricier organic stock for this purpose. I also put a tiny touch of olive oil in my saucepan after heating it, before adding the puree. It just ‘feels’ better to me when there is a bit of olive oil in a soup recipe (or just about anything else actually). I also purchased pre-cooked shrimp so they did not require much cooking time to heat through. If you do this, do not overcook the shrimp as they will get tough. This is a rich and filling soup…enjoy!